Because I haven't been a fan of any of the releases from the series, Glenmorangie's Private Edition range is a mystery to me. It comes down to "Why?" and "Whom?" Why is Bill Lumsden still producing these whiskies? And for whom is creating them? I'll start with the Whom? I know there's still somewhat of an Ardbeg cult out there awaiting Lumsden's annual winey peaty stuff. But is there anyone still breathlessly checking the calendar, anticipating the next Glenmorangie Private Edition? Like the Ardbeg special editions, GlenMo's Private Editions rarely eclipse the quality of the cheaper regular range, but unlike the Ardbeg specials the GlenMo Privates don't have much of a presence on the secondary market. Meanwhile, every single one since Finealta (2010) can still be found on the shelves in Southern California. (Okay, maybe not Ealanta, but that's due to Jim Murray's enthusiasm.) At the time of this post, there are a few local retailers that have three or more of the Private Editions side by side at their original prices. Are there other countries where these things do fly off the shelf? Then, Why? I have no doubt that Dr. Bill is awesomely talented. I think he improved the classic 10 year old; the Astar was great; and the 18 is a good drink. And on Islay, his team keeps cranking out the solid Ardbeg Ten. But what's with all the wine, man? When my whisky buddy, Andy, and I picked up a bottle for our whisky event, we started riffing on what the hell this looked like. I called it French Clown Whisky. Andy said it looked like something you'd buy at a carnival, along with cotton candy and a corndog. But then he nailed it, "The box looks like it should be holding my popcorn at a movie theater." Hard to top that one. Though to me, the design and font strikes of something Gallic (not Gaelic, despite the name). And I began to wonder...what kind of French entertainment would this be like...? Would it be a light fluffy lark like the works of Sartre and Noé? Or would it be soul-destroying nihilism like Maurice Chevalier? I shuddered at the thought. Its color is a slightly peachy gold. I'm assuming that's the Portuguese casks at work. The nose indeed achieves the candy shop effect Lumsden was aiming for. Orange brandy and cherry bubblegum. A big white chocolate note reminds me of Brenne's single malt. 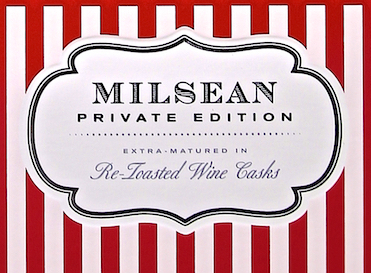 Give Milsean 15 minutes to breathe and you may find notes of circus peanuts and violets. The palate is very sweet with some ethyl heat. Lots of bubblegum and raspberry Schweppes. Lime lollipops. After that breathing time, a big note of vanilla marshmallows develops in the midground. The cloying finish starts out all Cherry Sudafed and sugar-free (read: aspartame-loaded) raspberry popsicles. Gradually it picks up some vanilla and a spicy buzz. Most of the fruity sweets wash out of the nose, leaving some oaky whisky. Big vanilla, caramel, and toffee notes take over. Some mint extract in the back. The palate picks up a big bitterness, beneath which vanilla and confectioner's sugar lies. I'm just going to list my notes as I wrote them: "really bitter, wow, woody and cardboardy papery". The finish is all bitter marshmallows, if that were a thing. Well, since Lumsden was aiming for a sweet shop, he succeeded. This is sort of a flavored-whisky without any added flavoring. But does the market really need another sweet whisky? Both Forbes and Serge Valentin (what a team!) say this whisky is for bourbon folks. I'd say it's for people who drink Mountain Dew Code Red for breakfast. If there's a Venn diagram of those two demographics, then this whisky is sure to please the crowd where the circles overlap. But it's not for me. I will say that the nose is very pretty and sort of lifts expectations. And there are no big flaws in the palate, when neat. But the finish proves too sweet for my teeth. In the Forbes writeup, Lumsden suggests one "add a few splashes of water". I found adding water knocks it totally out of whack. Personally this is not a whisky I'd choose to drink again and most of the people who drank it at last night's OC Scotch Club event feel the same. Once again, I'd take the 10 year old over this Private Edition. But for the sweet teeth out there, you may find this one tickles your cavities. As far as I can tell it's Bill Lumsden making whisky for Bill Lumsden. That's an explanation I can agree with. The "why" is very simple: these private editions sell Glenmorangie 10yo. They are not intended to make money, but to make a splash and to keep Glenmo & Lumsden fashionable and in the conversation. Your second statement makes sense to me. The special editions, along with the Lumsden dog & pony show, and the single malt industry's largest marketing budget keeps them out in front of eyes. And they do it more aggressively than any one else. I find it fascinating that they're willing to utilize such a large amount of resources (one of which, we keep being told, is in short supply) to hype their brand. Having seen business units elsewhere attempt to legitimize their existence by inventing projects and budget items, I wonder if LVMH has ever considered if they'd profit more by spending less on this sort of marketing. But I have a difficult time agreeing with your first statement. Here in California the number of stores and bars that carry the 10yo and the regular range outnumber those that carry the special editions at least 10 to 1. At least. And this is whisky hipsterland. The ubiquity and ery competitive price of the 10yo, along with their sponsorship of the PGA Tour and soccer, which gets them on television, is how I believe they move bottles. But I do see how all the special editions act as advertisements. 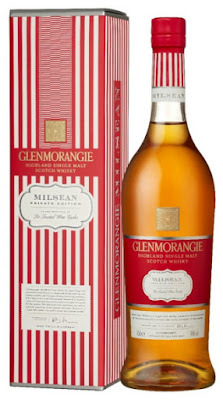 If Glenmorangie replaces the 10 year old with an NAS due to stock shortages, they will have lost my business. By releasing something "different" every year Glenmo, Ardbeg, and everyone else doing it, keeps the BRAND in the conversation. 90% of whisky consumers buy the SAME whisky every time they buy a bottle, but whisky nerds rarely do. Therefore, brands need something "different" on a regular basis in order to keep the talking head nerds (the bloggers or influencers if you will) talking. I agree in part with what you guys are saying. Of all the whisky companies, Glenmo/Ardbeg/LVMH do this the most aggressively, to the point where their brand seems to be.....the brand and nothing more. This might be due to LVMH being a luxury company thus it's so focused on the label as much (or more so) than the product. But Louis Vuitton and Moet & Chandon and Hennessey have legacies and histories much more substantial than modern Glenmorangie. Thus there's not much behind Glenmo's marketing when one looks back there. Is it me or are the Glenmorangie Private Editions alternating themes every other year? If we take Astar as Private Edition #0, all the even-numbered releases are grain or wood related (Astar-cask strength first fill casks, Finealta-peated, Ealanta-virgin oak, Tusail-Maris Otter barley) and the odd releases being finishes. Since you brought him up Michael, I couldn't resist putting this in the comments. "We do not even have a language! Just a stupid accent!" "She's right! We all talk like Maurice Chevalier!" Wow, that is a very deep cut. For Mel Brooks fans only. I think Tusail is the only release wherein he didn't F with the oak, which is why it's the only one I really want to try. Plus I like these alternate barley experiments. The Finealta had some new oak in it, as well as some sherry casks. Ealanta was all new oak. Astar was 100% his fully engineered casks. The man likes to play with his wood. "The man likes to play with his wood." I'm assuming you forgot the "no pun intended" at the end. 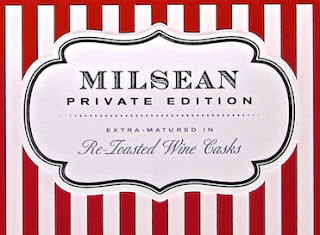 This does mean the next release will probably be grain or wood related and not a wine finish. I am hoping it will be another barley variety. Guys, guys, guys, stop talking so much about Lumsden's wood and his releases, you're just making my point!